www.securitysystemsnews.com NOVEMBER 2018 SECURITY SYSTEMS NEWS QUOTED/MARKETPLACE 30 QuotEd NAME COMPANY PAGE marKEtplaCE marKEtplaCE Statement of Ownership, Management, and Circulation 1. Publication Title: SECURITY SYSTEMS NEWS 2. Publication Number: 018-248 3. Filing Date: 10-1-18 4. 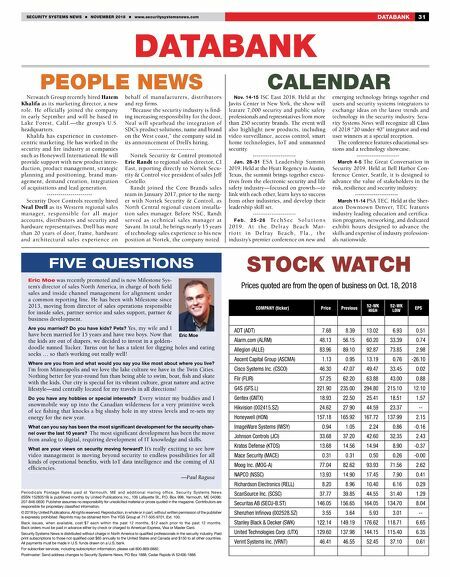 Issue Frequency: Monthly 5. Number of Issues Published Annually: 12 6. Annual Subscription Price: Free/Controlled Circulation 7. Complete Mailing Address of Known Office of Publication: 106 Lafayette St., Yarmouth, ME 04096-9998. Contact Person: Barb Schrafel, 319-364-6167. 8. Complete Mailing Address of Headquarters or General Business Offices of the Publisher: 106 Lafayette St., Yarmouth, ME 9. Full Names and Complete Mailing Addresses of Publisher, Editor, and Managing Editor: Publisher, Rick Rector, 106 Lafayette St., Yarmouth, ME 04096-9998 Editor, Paul Ragusa, 106 Lafayette St., Yarmouth, ME 04096-9998 Managing Editor, Spencer Ives, 106 Lafayette St., Yarmouth, ME 04096-9998 10. Owner: J.G. Taliaferro, Jr., 106 Lafayette St., Yarmouth, ME 04096-9998 11. Known Bondholders, Mortgagees, and Other Security Holders Owning or Holding 1 Percent or More of Total Amount of Bonds, Mortgages, or Other Securities: None 15. Extent and Nature of Circulation: Average no. copies No. copies of single each issue during issue published preceding 12 months nearest to filing date a. Total Number of Copies(net press run) 22,646 22,488 b. Paid and/or Requested Distribution (1) Paid/Requested Outside County Mail Subscriptions 14,769 14,921 (2) In County Paid/Requested Subscriptions 0 0 (3) Sales: Dealer, Carrier, Vendor, Counter, and Other 0 0 (4) Requested copies Other Classes mailed through USPS 0 0 c. Total Paid and/or Requested Circulation 16,769 14,921 d. Nonrequested Distribution (1) Nonrequested Outside County Copies 6,919 6,683 (2) In County Nonrequested As Stated On Form 3541 0 0 (3) Nonrequested Other Classes Mailed through USPS 0 0 (4) Nonrequested Distribution Outside mail 302 20 e. Total Nonrequested Distribution 7,221 7,103 f. Total Distribution 21,990 22,024 g. Copies Not Distributed 656 464 h. Total Issues 22,646 22,488 i. Percent Paid and/or Requested Circulation 67% 68% Electronic Copies a. Requested and Paid Electronic Copies 2,801 2,838 b. Total Requested and Paid Print Copies (Line 15c) + Requested/Paid Electronic Copies 17,570 17,759 c. Total Requested Copy Distribution (Line 15f) + Requested/Paid Electronic Copies 24,791 24,862 d. Percent Paid and/or Requested Circulation 70.9% 71.4% I certify that the statements made by me above are correct and complete. Rick Rector, Publisher 10-01-18 www.securitysystemsnews.com Delray Beach, FL Feb. 25-26, 2019 Save the date! 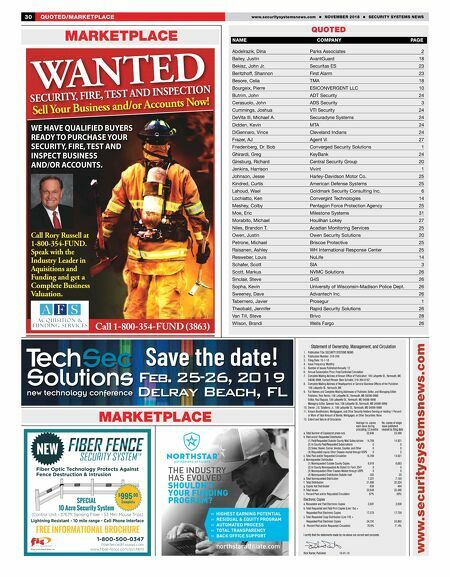 Abdelrazik, Dina Parks Associates 2 Bailey, Justin AvantGuard 18 Bekisz, John Jr. Securitas ES 23 Beritzhoff, Shannon First Alarm 23 Besore, Celia TMA 18 Bourgeix, Pierre ESICONVERGENT LLC 10 Butrim, John ADT Security 24 Cerasuolo, John ADS Security 3 Cummings, Joshua VTI Security 24 DeVita III, Michael A. Securadyne Systems 24 Didden, Kevin MTA 24 DiGennaro, Vince Cleveland Indians 24 Frazer, AJ Agent Vi 27 Friedenberg, Dr. Bob Converged Security Solutions 1 Ghirardi, Greg KeyBank 24 Ginsburg, Richard Central Security Group 20 Jenkins, Harrison Vivint 1 Johnson, Jesse Harley-Davidson Motor Co. 25 Kindred, Curtis American Defense Systems 25 Lahoud, Wael Goldmark Security Consulting Inc. 6 Lochiatto, Ken Convergint Technologies 14 Meshey, Colby Pentagon Force Protection Agency 25 Moe, Eric Milestone Systems 31 Morabito, Michael Houlihan Lokey 27 Niles, Brandon T. Acadian Monitoring Services 25 Owen, Justin Owen Security Solutions 20 Petrone, Michael Briscoe Protective 25 Raisanen, Ashley WH International Response Center 25 Resweber, Louis NuLife 14 Schafer, Scott SIA 3 Scott, Markus NVMC Solutions 26 Sinclair, Steve G4S 26 Sopha, Kevin University of Wisconsin-Madison Police Dept. 26 Sweeney, Dave Advantech Inc. 26 Tabernero, Javier Prosegur 1 Theobald, Jennifer Rapid Security Solutions 26 Van Till, Steve Brivo 28 Wilson, Brandi Wells Fargo 26 WE HAVE QUALIFIED BUYERS READY TO PURCHASE YOUR SECURITY, FIRE, TEST AND INSPECT BUSINESS AND/OR ACCOUNTS. Call 1-800-354-FUND (3863) WE HAVE QUALIFIED BUYERS WANTED SECURITY, FIRE, TEST AND INSPECTION Sell Your Business and/or Accounts Now! Call Rory Russell at 1-800-354-FUND. Speak with the Industry Leader in Aquisitions and Funding and get a Complete Business Valuation. Fiber Instrument Sales, Inc.